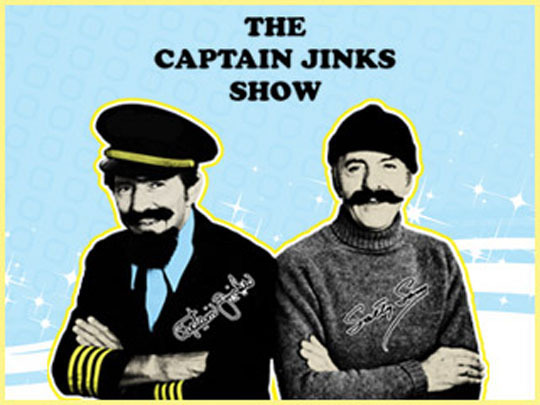 Captain Jinks and Salty Sam are two of the most legendary and well-known entertainers from Peoria, Illinois. Their show for children (and adults) was the most popular local show in the history of Peoria TV. At one point in the mid sixties they had had over 40,000 requests for 8 x 10 glossy photos and the show had huge ratings that rivaled the nighttime network shows. The daily program was done live without a script by the Captain and Salty and it’s been rumored that the good Captain indulged in a little liquid encouragement now and again, but that’s just a rumor! The show ran until 1972 and then they brought it back in 1978 and that version ran until 1981. Luckily through YouTube the show and Captain and Salty live on and below are four videos starring Captain Jinks and Salty Sam. Here’s the theme song from the show, but my favorite part of the whole video is Captain Jinks and Salty Sam cracking up while filming some sort of promotional commercial at the start of the clip. There’s also some nice images of the two of them within this video. This is a nine minute clip of the show from the ‘70’s in its second incarnation (Sadly there’s no footage from the first run of the show in the ‘60’s, just still pictures remain from that era.) The Joke Barrel segment starts it off but what I find interesting is from the three minute mark on where they’re interviewing kids and asking them what they’ve done to make mommy and daddy happy. The whole thing is pretty awkward and the funniest part is where a girl says she watched her brother and sister and Captain Jinks thinks she said she “washed” them! Ha ha ha! I wonder if any of these kids still live here in Peoria today? If so, let us know in the comments section or on the MBIP facecrack page! In this video Captain Jinks and Salty Sam are giving a tribute to Robyn Weaver on his 30th anniversary at WIRL radio. Robyn was one of the most popular radio personalities at the time. Listen for his unique voice and recipes at the end of the clip. 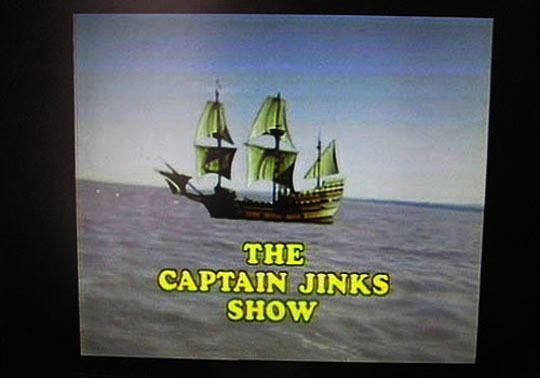 In 2012, veteran WEEK news anchor, Tom McIntyre hosted a TV special about The Captain Jinks show. The special had clips of the show and interviews with other media personalities including Lee Hall, Bill Houlihan and clips from an interview with Stan Lonergan A.K.A. Captain Jinks. It also included former cast member Joe McGuire who was Bosun Joe on the show in the ‘70’s. We met Bosun Joe a while back and you can read that post right here. Here’s a video from that TV special. Related Posts: WMBIP Video Thursday: Repo Man, A Hard Day’s Night and Hometown Heroes.